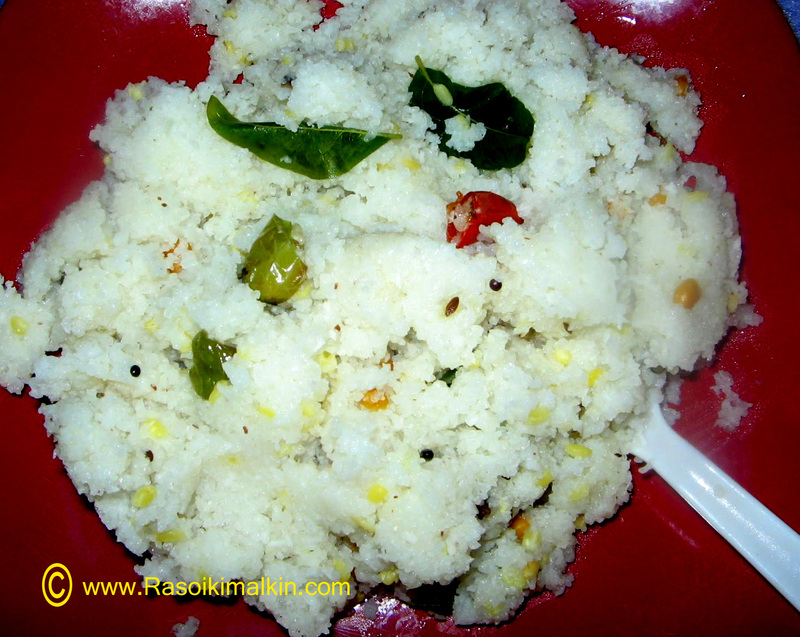 This one can be had as a tiffin and is identical to upma. Can be had as a tiffin while fasting,doing upavasam. This one is prepared more especially in villages. Place a pan on the stove add 2 tbsp (if u are not calorie conscious add 3 to 3 1/2 tbsp of oil),after heating add channa, and urad daals,and mustard seeds,after they splutter saute for 2 to 3 min. Then add green chilli slits and ginger slits and saute well on low temp..
Now add water , and add grated coconut,washed yellow moong daal. And when the water started boiling ,add salt. Then slowly add the rice ravva slowly,without forming lumps. Mix well,cover with a lid. Let it cook in sim. Stir once or twice in between. Switch off the stove.Serve hot with chutney. Safe and a healthy one. Manchi Tiffin present chesaru Kanthi garu. didnt try upma with rice rava.. sounds tasty! Thank you chaithra,sathya, uma and krishnaveni .